The rugged Guide V177 T features a spacious layout and an optional console. This roomy 17' tiller model is versatile enough for every fisherman's consideration. A vinyl floor, extra-large 27 gallon livewell and abundant deck storage make this a no-nonsense package for the angler who recognizes a boat intended for hard use and great results. STANDARD PACKAGE Riveted three-piece, .100 gauge hull with GX2 .064 double-plated bow | Painted urethane high-gloss color, unpainted bottom | Precision fit, powder- coated 3" tubular steel Trail Guard® trailer w/ locking detachable tongue, space saving and security | 13" radial tires, tongue jack and windguides Switch panel includes Faria® fuel gauge, 12- volt outlet, rocker switches with master power, navigation lights, bilge and aerator. F50 . F60 . 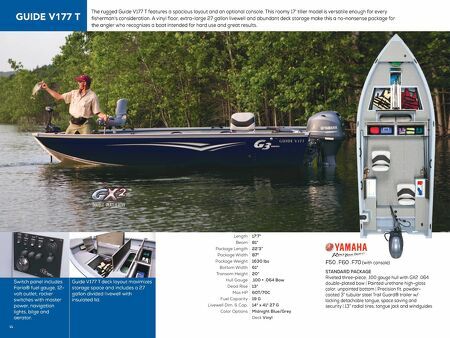 F70 (with console) 17'7" 81" 22'3" 87" 1630 lbs 61" 20" .100 + .064 Bow 13° 60T/70C 19 G 14" x 41" 27 G Midnight Blue/Grey Deck Vinyl Length Beam Package Length Package Width Package Weight Bottom Width Transom Height Hull Gauge Dead Rise Max HP Fuel Capacity Livewell Dim. & Cap. 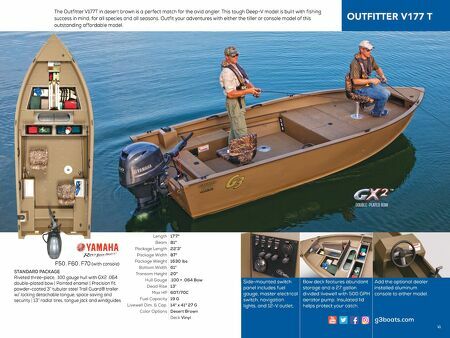 Color Options 44 Guide V177 T deck layout maximizes storage space and includes a 27 gallon divided livewell with insulated lid.